Need pool fencing? Galvanised pool fencing made from our galvanised pool fencing panels could be the perfect option for you! At Everlast Services, we’re the pool fencing experts. We know all the regulations off by heart, so we know how to create a fencing system that will keep your family safe and make your pool look incredible. We love using galvanised panels for pool fencing because they are cost-effective, they look fantastic, and because we manufacture them ourselves, we know they’ll last forever, and we can customise them as much as you like! It doesn’t matter how big or small your pool is, our skilled fabricators will create the perfect panels and posts for your needs. We also offer powder coating at our factory, and you can choose from a wide range of colours. 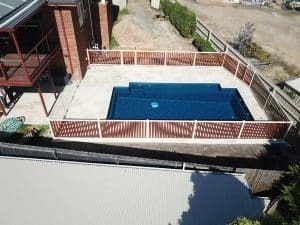 We’ve installed galvanised pool fencing at a number of properties, all with different pool landscape designs and they’ve always come up a treat. The best part is, they can be erected in no time at all because all we have to do is bolt the panels onto the posts. We use local products and manufacture all of our steel products in-house at our plant in Hoppers Crossing. We are 100% Australian owned and operated and dedicated to keeping your dollar in the local area. You can rest secure in the knowledge that a contract with us is a contract to give back to the local community and support the local economy. Manufacturing our products gives us two distinct advantages. Firstly, we make huge savings by cutting out the middleman and we always pass these savings on to you. Secondly, we can back the quality of our products because we are in control of the quality assurance process. We’ve been providing a fencing service for over 20-years. As a family-owned company, we’re incredibly proud of our reputation which has been built on outstanding service delivery and customer care. We offer much, much more than fencing. We’re your one-stop shop for all your landscaping needs, including concreting, decking and paving.